Today is the 15th anniversary of the murder of Tejano singer Selena. So I'm in a bit of a sad mood. Several things have happened recently which just reiterate the fact that I'm a super-sensitive viewer. On Saturday night, I was at some trashy bar and there were some 100 screens showcasing the UFC 111 - Ultimate Fighting Championship. My eyes could not avoid the fight. I would have to look down at the ground or up at the ceiling if I didn't want to see two guys beating the living daylights out of each other. We had seen 3 fights and when they were on the George St. Pierre vs. Dan Hardy fight, I had had enough. My heart couldn't bear seeing Hardy's eye almost pop out of his head and both his arms be almost dislocated. I just had to get out of that bar and away from that fight. Please don't beat up this guy. He's got a nice mohawk! And he's from Nottingham, England. On Sunday, by good friend Mark (super genius awesome author extraordinaire) wrote a post about the film Beyond Rangoon (1995). It's a film I could never bring myself to watch. I had caught a pivotal scene in the beginning of the movie on TV some years ago and I have been traumatized ever since. The scene involved Patricia Arquette's character arriving at her home only to discover that her husband and young son have been brutally murdered. I immediately switched channels and have not touched the movie since. That one scene still haunts me to this day. A couple of weeks ago, Classicflix randomly chose to send me Crime School (1938) in the mail and I'm glad they did. It was such a wonderful movie and I can see why certain bloggers like the Dead End Kids. My beau Carlos found many correlations between this movie and Brubaker (1980) and encouraged me to watch the latter and compare the two films. The plots are very similar yet Brubaker has a lot more violence. In one part of the movie, the new warden played by Robert Redford discovers that one of the prisoners has been there a few years longer than his sentence required. Just as this older gentlemen is to be released the bad bad prison guards decide to kill him since he holds many secrets, including the locations of the graves of murdered prisoners. When I asked Carlos if the sweet old man was going to die, he admitted that he would and I burst into tears. We had to stop the DVD so I can regain composure. Needless to say, we had to skip over that part because I just couldn't deal. 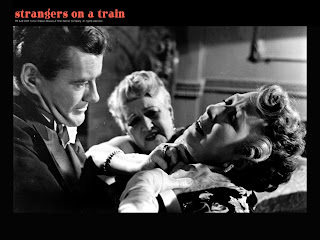 Do you remember when I told you that I hyper-ventilated the first time I saw Strangers on a Train (1951)? Yeah. Something about an old lady being choked at a party just rubbed me the wrong way. Anyways, Carlos tried to calm me down by telling me that these were only actors and this wasn't real. EXCUSE ME? For me at least, the whole point of watching a movie is to be swept away by it. Not to see it as something fake, but to momentarily be taken into another world, into other people's lives, into other experiences. Carlos likes to find goofs, bad cuts and other errors. He likes to figure out the plot as early on as possible. I like to find literary/cultural references and to ride the magical ride that the plot takes me on. So no. To me this isn't fake this is the real deal. And guess what? Brubaker is based on a real story. And guess what else? The older gentleman who was murdered in the story died in real life before the movie hit theaters. So no Carlos. This isn't fake. That man really did die. So yes, I have a real reason to shed my tears. So for me this is all to real. I can't take the violence. Fake violence (Brubaker) or real violence (UFC 111), to me it's bad. Really really bad. I find it sad that most people are so immune to images of violence that it doesn't even faze them. I don't want to be immune. When I see someone being hurt, I want to be able to empathize. I don't want to be insensitive. 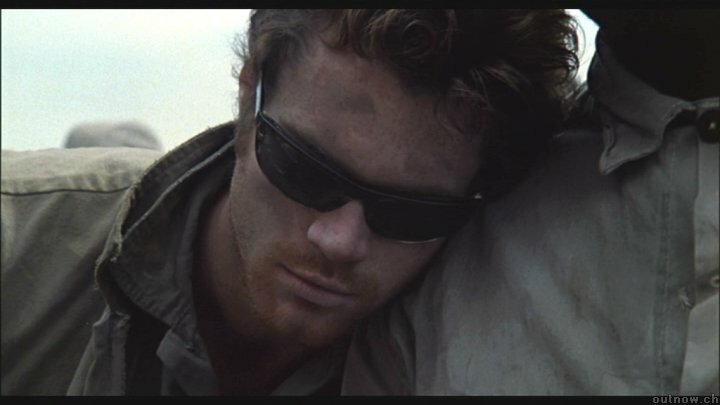 So when the character Bullen (played by the delightful David Keith) tells us about his unfortunate upbringing and the brutal murder of his twin brother, we should feel empathy. When the prison guards eletrocute him a bit to punish him, we should feel empathy. When Bullen meets his demise, we should be sad. Isn't that the whole point of a story? That it should get us to feel something? It makes me feel too much because I am too sensitive but I worry about those who don't feel anything anymore. P.S. Carlos doesn't force me go to trashy bars, watch UFC fights or see violent movies against my will. He's a very sweet boyfriend, I promise! There's nothing wrong with being sensitive to violence, and I always appreciate the masterful directors who can shock us without resorting to bloody portrayals. Reaction shots are often more than enough. The Hardy/St.Pierre fight was pretty gruesome. Dan Hardy's perseverance cannot be questioned, and when his technical skills improve further I imagine he'll have that belt someday. He's a great showman and would be great for the sport. Let me get this straight: your beau says you shouldn't let cinematic violence affect you because it isn't real, and then he escorts you to a night of Ultimate Fighting Championships, where you shouldn't let the violence affect you because it IS real? Huh? I have to agree with you, Quelle: movies represent reality in order to shape our experiences into an aesthetic and/or moral order, and the fact that cinematic violence isn't real is beside the point—-it doesn't represent itself as real. Unless the film is a docudrama or an actual documentary, the story is a commentary on reality, so that instances of violence stand in for the real thing, referring the viewer back to the world of real violence. To be disturbed by cinematic violence is both to empathize with the characters and to be disturbed by the actual violence that the story refers to. BTW--my wife had the same reaction to that opening scene in Beyond Rangoon, and I had to talk her into watching the rest of the film, which also includes many images of war violence, though it is an anti-war film. Have you ever seen Ingmar Bergman's Vietnam-era film "Shame?" One of the most powerful anti-war films ever made and almost no violence whatsoever. . .
generally speaking i do not like mindless type violence. films like Goodfellas, Donnie Brasco, Braveheart, Pulp Fiction and pretty much any war film are going to have violence on some level as a necessary part of bringing those worlds to life on film. to whitewash it would not be true to the characters or the situations. Films like Saw I, II, III, XXIII, or any of those cheesy slasher films etc etc have NO interest for me whatsoever. that's violence for the sake of violence. the "story" serves the violence, not the other way around. Very few films with ANY violence make my favorites list. A few with quite a lot are on my list (The Godfather, Star Wars, Bladerunner)but I always have to psych myself up for certain parts. I've only watched Psycho once. Even Charade bothers me a bit. The murders are too graphically depicted. I hate Tarantino and Peckinpah. I tolerate the Cohen Brothers but I like their less violent films more. I hat how their is a cult of violence among film fans. Good on you, Quelle for this post. There is absolutely nothing wrong with being sensitive to violence. But at the same time I think there's nothing wrong with someone if he or she enjoys violent movies. For me they are a bit of a catharsis at times. At other times they are simply a sad reflection of the world in which we live. My major objection is only when the violence is totally gratuitous. As Tommy pointed out, reaction shots are often enough. Such wonderful comments. Thank you so much everyone for sharing your opinions on the matter. Tommy - I agree with you. 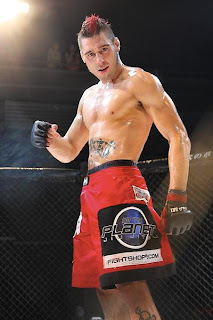 I highly admire Dan Hardy for persevering even through dire straits. If I came out with anything from the UFC 111, is that the human will can be strong enough to endure brutal physical pain. Mark - I didn't mean to suggest Carlos forced me to watch UFC after I said I didn't like violence. We were going to a birthday gathering which just happened to be at a trashy bar showing UFC. UFC wasn't the reason we were there. :-) He's a sweet guy, Honest! Artman - Happy Birthday BTW. Are you suggesting I blather on during a movie? I only asked Carlos a couple of questions because I wouldn't have watched Brubaker by myself and I didn't want to watch anything that was incredibly violent. So in a way, my talking during the movie was a good thing. Also, I really enjoy an interactive experience with movies. Sometimes I'll stop a film in the middle to do some online research or to discuss somethings with Carlos or a friend before proceeding. I still get swept away in the story though. I don't think that prevents me from doing so. I also sometimes take notes on the film as I'm watching it. But of course, that's me and you are different and that's what makes us all special! Jenny - Cult of Violence - that's dead on. Literally! I couldn't bring myself to watch Sin City. The violence was just too much. I think nowadays it's glorified. Mercurie - I don't mean to say violence shouldn't be in movies. The reason I wrote this post is just to point out how desensitized we are to it. That trashy bar was full of people who didn't even blink when blood spurted out of some fighters face. Where as I couldn't bear to look. I know you like scarier movies and that's okay by me! some of the titles people listed as being violent to them really surprised me... Great escape, Star Wars...goes to show how subjective that kind of thing can be. i didnt mention it but i pretty much hate all sports but especially the ones where two guys just get in a square and beat the crap out of each other all the while people are cheering them on.